There is a dent in a wall at Battersea Arts Centre where the actor Jason Thorpe banged into it night after night in CLOD ENSEMBLE’s first ever production, Feast During the Plague (1995). The force of the bang caused him to fall backwards. The piece was based on Pushkin’s ‘little tragedy’ in which a group of villagers throw a party in the midst of a great plague much to the disgust of a local priest. It depicts a society living perpetually under the stress of disease – drinking, dancing, weeping, fighting, saying the wrong thing, falling apart, putting themselves back together and falling apart again. So, when Jason, dressed as a ghost with a tablecloth over his head, banged so hard into the wall it was very funny. A relief. This was the first of many falls I have watched in the 21 years that CLOD ENSEMBLE have been making performances. I have never had any formal training in dance. After doing a degree in Drama at Manchester University, I studied for a year with the brilliant teacher Jacques Lecoq at his school in Paris. Lecoq said every dramatic terrain operates in a different plane in space. Tragedy happens on the vertical plane, melodrama on the diagonal and clown on the horizontal. Falling can be comic and tragic. Clowns are nearer the ground so there is less far to fall than for elevated tragic protagonists who have a lot to lose. When the fool laughs he falls into a somersault. When King Lear falls the whole country dissolves into conflict and destruction. ‘A portly gentleman striding purposefully along, only to slip on a banana skin and be sent sprawling to the floor’, he explains that if the man was lying in a pool of blood it would not be funny. ‘Laughter evolved as a way of signalling the all clear’. I’ve been struck while writing this piece by how the falls in our work seem to signal extreme moments. Whether comic or tragic – a fall is an interruption, a clearing, an opportunity to start again, a ground zero. The main principle of Lecoq’s work is that everything moves – elements, materials, seasons, animals, light, paintings, colour, music. In the first year at his school, students copy these movement dynamics in nature and so not surprisingly, they spend a lot of time falling – falling leaves, falling snow, setting sun, avalanche, rainfall, water fall, night fall. When Lecoq talks about mime he is not talking about the pantomime of Marcel Marceau but about ‘mimesis’ – a fundamental human action. Physical re-enactment is essential to human development and understanding – a natural way to acquire knowledge of the world. Children are constantly miming the world as a way to get to know it. 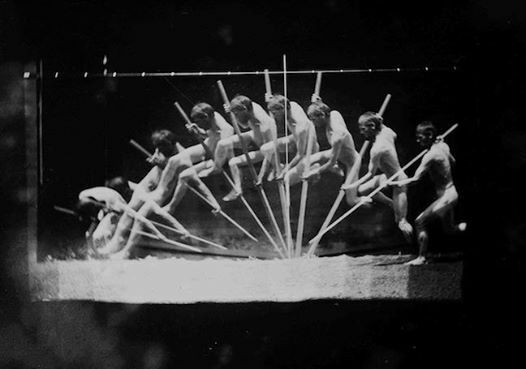 The movement dynamics that are observed and embodied are then transposed into theatre. For example, if I am playing anger I do not start psychologically, but instead take on the movement of fire. If my lover has left me I might embody a sunset. If I am playing a strong leader, I find a mountain inside my body. If my world is in chaos, I embody an earthquake. 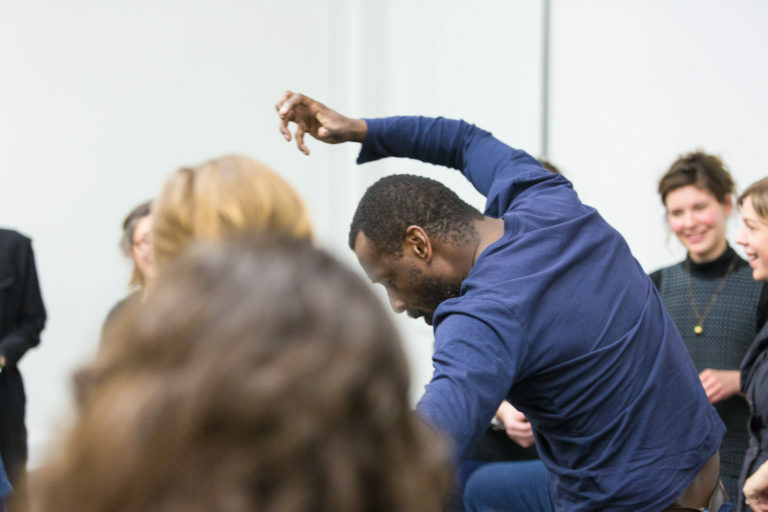 I work with these principals all the time in the rehearsal room – these movement dynamics offer a choreographic language which everyone can understand no matter what background or technique they bring with them, whether it be contemporary dance, music, classical ballet, or theatre. This is important as I am often working with very different types of performers on the same production. At Lecoq, the work exploring the movement dynamics of paintings had a big impact on the way I look at still images. 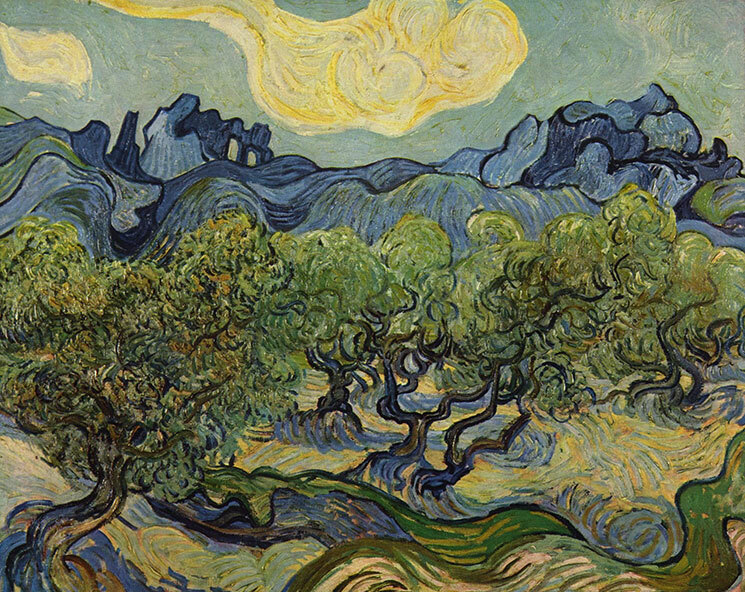 How does a Van Gogh painting move differently to a Salvador Dali? A Frida Kahlo to a Magritte? As well as the movement dynamics of the composition and texture of the painting, I am also interested in the moment before and after the image. When CLOD ENSEMBLE had been going for about a year we were given the opportunity to have a week of R&D at the National Theatre Studio and chose to work on paintings. I realise now that the research we did in that week has fuelled much of our work since. We began with Bruegel’s Netherlandish Proverbs (1559). 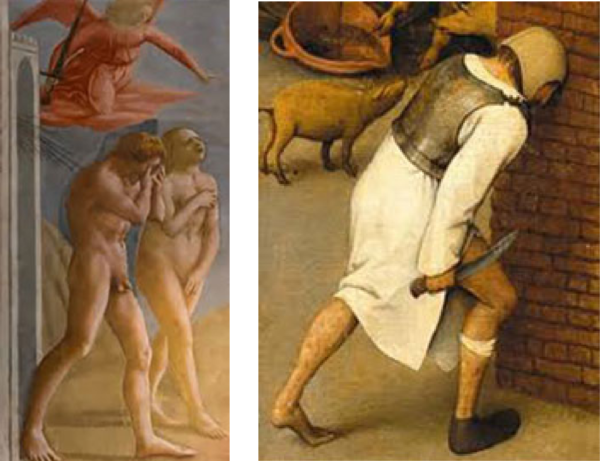 Here is a detail of a man banging into a wall, reminiscent of Jason in the Feast During the Plague. He won’t give up trying to knock the wall down with his head even though it is made of brick. Bruegel is important to me both because he worked with allegory and myth (The Battle of Carnival and Lent, Landscape with the Fall of Icarus) and because he painted the crowd, always seeing the bigger picture. He plays on perspective, encouraging the viewer to see events in the distance as just as important as those in the foreground. Brecht compared Bruegel’s paintings to epic theatre. He wrote ‘Breughel [does not] practise the separation of comic and tragic; his tragedy contains a comic element and his comedy a tragic one”. His paintings are full of falls. Next, we looked at Masaccio’s Expulsion of Adam and Eve from Eden c.1424 which is painted on the wall of the Brancacci Chapel in Florence. For me, this image of The Fall is not so much about original sin, forbidden fruit and the tree of knowledge (ideas that are so problematic to me I don’t even know where to begin) but the sense of what these people have left behind – the space behind them, the unknown space in front of them, the sadness in Eve’s face and the way she covers herself up, her shame and disempowerment; his inability to look ahead, his despair. They are falling from grace, whatever that grace might have been. A mythic fall. There is a beautiful Lecoq exercise where as a chorus you embody the movement dynamic of lava flowing down the edge of the volcano and then you transpose this into a scene of a mass exodus. The collective movements of people and animals are another ongoing theme in our work. 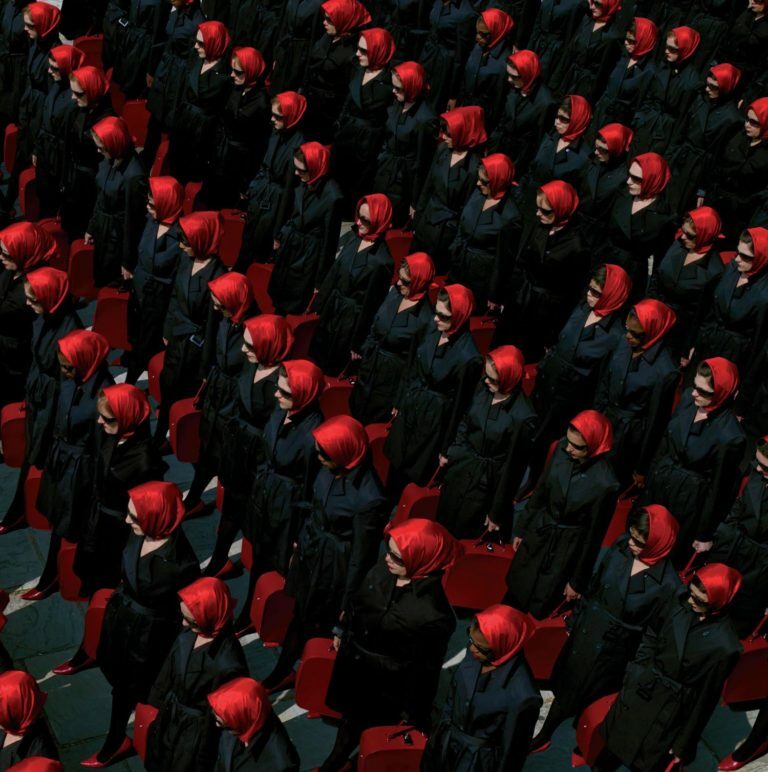 In Red Ladies (a piece for 18 identically dressed women), the choreography is drawn from the movements of a herd of bison, a flock of birds, a swarm of bees. Like a chorus in a Greek tragedy, the Red Ladies witness world events and they reflect these back to the audience through movement. These women have a mythic dimension – they have seen it all before, and big world events often involve a fall of something or someone – the Fall of Troy, Hiroshima, the ice caps melting, stock exchanges crashing, the twin towers collapsing, empires crumbling. Collectively, across generations, they remember the consequences of our actions – the fallout – and for them this remembering is an ethical act. Red Ladies fall into line, they fall into the beat. There is a history of women falling into line. But these women have agency, responsibility. They won’t fall for it. Perhaps Beyonce’s recent call to action, Formation, is coming from a similar desire for change. Red Ladies demonstrate the trappings of femininity. However easy Beyonce makes dancing in high heels look, walking in stilettos (let alone dancing in them) is a serious business and it is easy to trip. These tiny fallings – these totterings – these precarious ways of gaining power through being vulnerable are reflected back as they walk the streets, deviating from the given path, transforming the landscape. Sometimes Red Ladies take risks to gain a different perspective, climbing high and standing on precipices. Silver Swan (1999, Battersea Arts Centre) is a piece that is explicitly about falling. The audience of only 15 at a time watched it from the balcony above. This piece is a response to an experience of grief and the feeling of needing to get close to the earth, to submit, to hold on tight, so you don’t just evaporate or melt or disappear. The floor is the only place to be. We watch the woman who is addicted to the ecstasy of the fall the bliss and surrender, who slams herself to the ground till she is broken; the man who keeps banging into the wall, repeating the same mistake; the woman who is so desperate not to fall that she becomes frozen and inert; the man who always clings to the wall for fear of falling. 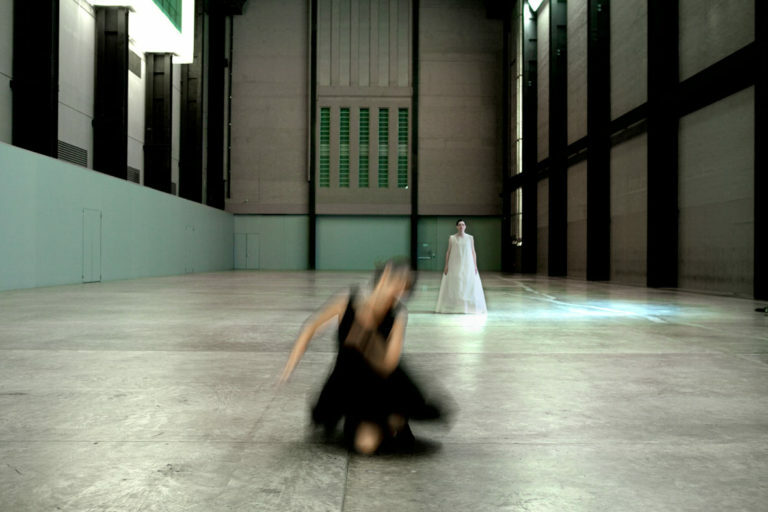 We have performed this piece many times, most recently at the awe-inspiring Turbine Hall (2012). Again the audience watch the little human beings dwarfed by the enormity of it all from above. 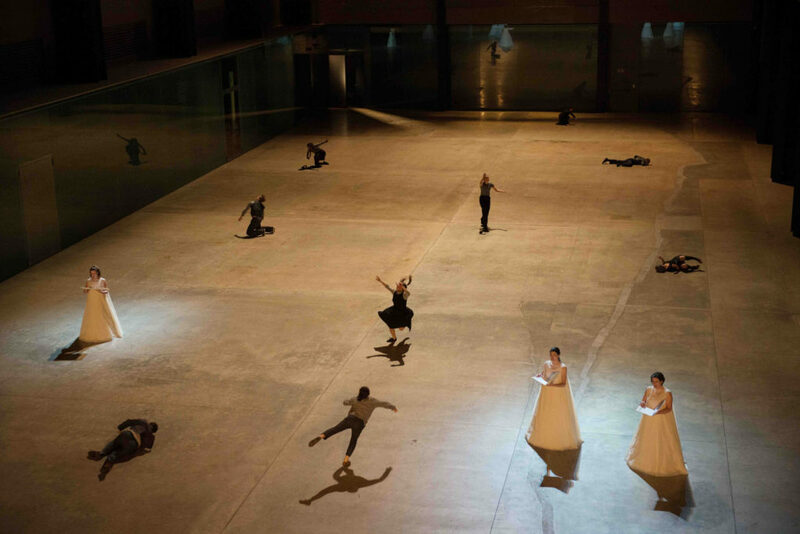 On stage throughout, a chorus of seven women in big white dresses sing as if floating, disembodied, oblivious to the human beings around them and on the floor. Paul Clark (the other Artistic Director of CLOD ENSEMBLE) and I grew up during the Thatcher years with a Conservative government who held on to power ferociously in the 80s and 90s, so perhaps it’s not surprising that the rise and fall of powerful figures and structures is of interest to us. The moment when Conservative MP and Cabinet Minister Michael Portillo lost his seat in the 1997 election was a defining moment in British politics. Twenty years later, here we are witnessing a political system in chaos with political rivals, established orders, and ideologies falling like dominoes. To fall – to become less or lower; become of a lower level, degree, amount, quality, value, number, etc. ; decline. Time for a favourite song by The Fall. Our piece, Zero, was full of images of balancing, descending and falling – people in varying in states of bliss, abandonment or despair. People standing on the brink, taking steps which lead to their own, or others, annihilation. We constructed a tall tower on the stage – our cliff. We also played this well known recording of a man ‘encouraging’ his girlfriend to hang glide in America. Once, I went to visit Icwazu Falls in Brazil and the day before I arrived a grandmother had jumped over the edge holding her grandchild. What possessed her? A desperation or an ecstasy? 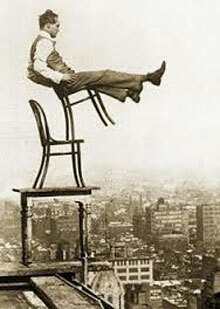 A dizzying vertigo? 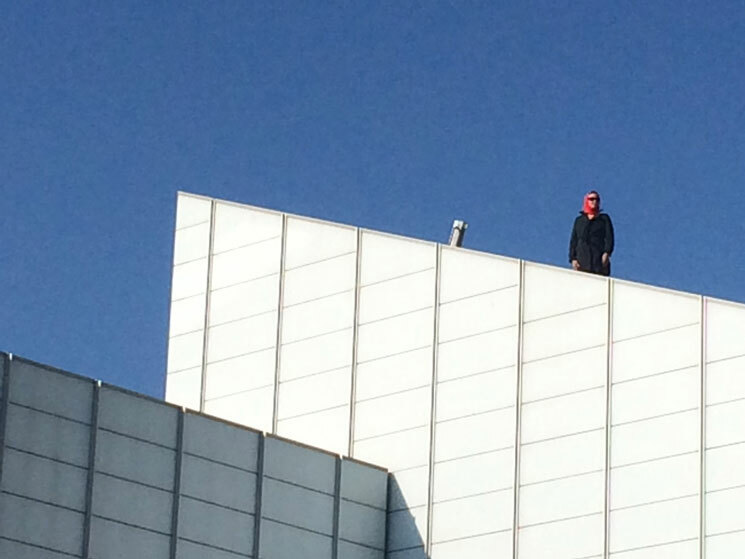 These people who step over the edge – Cordelia; the boy/girl in the red dress in Sarah Kane’s Cleansed; the woman found hanged in the forest who could not live through the storm of ethnic cleansing in Bosnia – it’s hard to face these leaps of despair, these yieldings, but perhaps they are important to remember. In Kiss My Echo (BAC, 2001) we see falling as an ‘unexplained symptom’, as an hysterical gesture – as an attempt to cope or perhaps a failure to cope. A return to the swoon. This was the first of several CLOD ENSEMBLE performances which are inspired by medicine. In an early version there was an installation where the performers bought to life medical illustrations of people who had fallen ill and some of the barbaric treatments they had to endure. 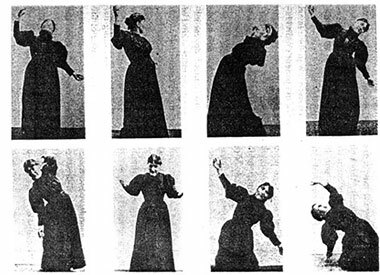 We re-enacted this image of the famous ‘chorea dance’, with its strange mixture of control and the relinquishing of control – all played out to the physician’s camera. Medicine is an endless source of fascination– complex, troublesome, uplifting, outrageous, triumphant, sorrowful. As well as making performance exploring these themes (Under Glass, 2009; An Anatomie in Four Quarters, 2011, Must, 2008) – we have also developed a long-standing collaboration with medical educators and clinicians in the form of the Performing Medicine programme which draws on techniques and ways of thinking that come from the arts to teach health care professionals skills relevant to their clinical practice. When bodies fall apart, we need to trust others to cushion the fall, to clear up the mess, to make us feel better. 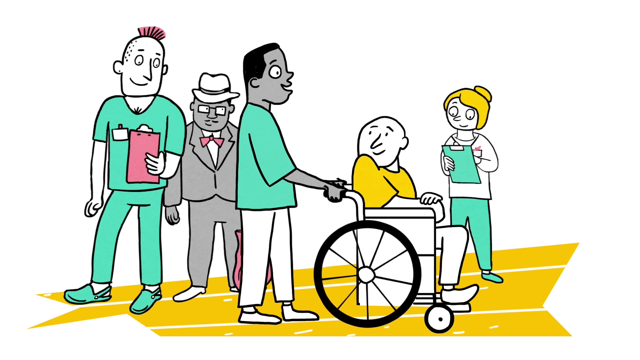 Much of our work with health carers is movement based because although they are thinking about bodies every day, health professionals learn relatively little about how to use their own bodies in their training. For many working in fields of dance and theatre where thinking and doing, sensing and moving are integrated and the idea of a mindful body is fundamental, the thought that these ideas are not fundamental to medical practice seems counter-intuitive, paradoxical even. Performing Medicine to an extent has been an act of translation between two languages – medicine and the arts – a kind of bridge which attempts to melt some of the polarizing and binary ways of thinking (mental/physical, technical/non- technical, subjective/objective, emotional/intellectual, well/ill, right/wrong) which can feel brutalising when they are institutionalised and affect the way people are being treated and spoken to. 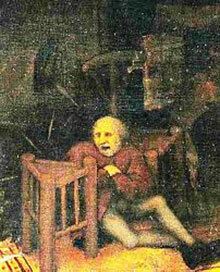 At times, when trying to persuade the medical establishment to embrace these ways of working and thinking I have felt like our man in the Bruegel painting, banging his head against a brick wall and engaged in an almost Sisyphean task – rolling a large rock up a steep hill, always worried it is about to come tumbling back down on my head. I am sure this is a feeling that many of us engaging with the NHS share, whether as employees or patients. Yet over the last 15 years I have been doing this work the attitude to collaboration and exchange has transformed. There are many, many healthcare professionals who have an appetite for change and are keen to collaborate in the search for new ways of working which feel more connected, more sustainable, healthier. CLOD ENSEMBLE’s work has always been created in this space of in-between things. It began with a collaboration between myself and musician Paul Clark – a meeting place of music and movement – and we work with people from many different disciplines. But for me, genres, definitions and categories are only useful if they help us to interpret and contain the world – they are a means to an end and should be resisted if they become limiting or reductive. Some of my favourite work in dance, music, theatre happens in this space in between – where something is at risk and a new form is required as we fall into the unknown space ahead. (Michael Clark’s collaboration with The Fall in the 80s is a perfect example). For the rapidly increasing number of interdisciplinary artists who feel limited by definition or by binary ways of thinking, it can be all too easy to fall through the gaps between one thing and another – so it feels important to nurture this in-between territory as a powerful space of possibility. That is why the image of a dance umbrella feels so inclusive. Looking at our work through this falling lens makes me feel that all our work has been about falling. And there are many more falls I could talk about: a man falling asleep in an armchair, an egg and spoon race, a woman holding onto a trapeze by her toes, a Narcissus falling for his own reflection and an Echo falling hopelessly under his spell (a good excuse for a Nina Simone song). I’ll leave the last words to Peggy Shaw, an artist with whom we made Must (2007) in an extract from a new piece we are making called Catching The Light. Originally published as part Dance Umbrella’s Definite Article series, 10 September 2016.